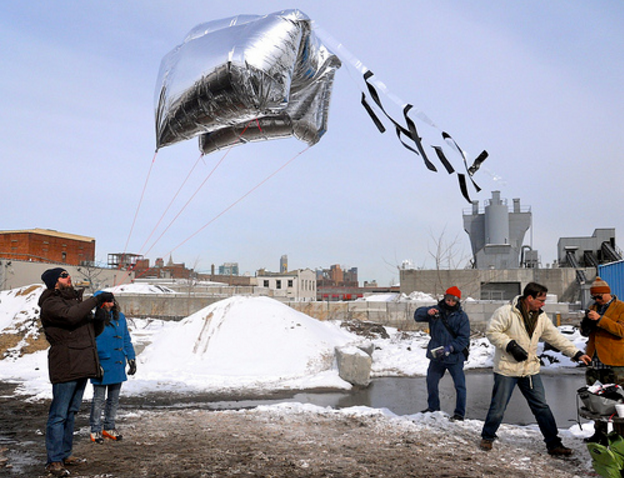  Public Lab: How do I stabilize smaller balloons and prevent them from being blown down in the wind? Question: How do I stabilize smaller balloons and prevent them from being blown down in the wind? When flying smaller balloons like in the #mini-balloon-kit, a common issue is that due to the lower lift of these (say, one to three 36 inch mylar balloons) they are more sensitive to light winds blowing them down. What happens is that the whole setup flies at a lower angle, rather than straight up. Are there ways to add fins, tape or glue the balloons into some pattern, or otherwise stabilize the balloons so that they aren't as sensitive to wind? Perhaps to even generate lift, like a kite-balloon-hybrid (there's a LOT on that page!)? 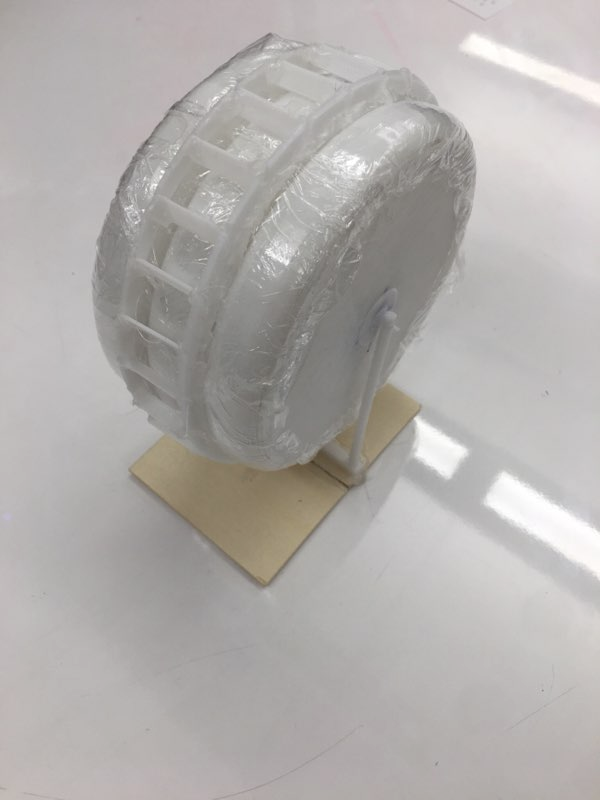 Currently we are trying to figure out the exact design parameters (materials, # of balloons, max lift, target wind speed, max wind speed, tethering system) that will go into the a next prototype that will be a lot closer to the final design. We have CAD models of the design and are quickly iterating in virtual space and with scale models to find an optimized design. The design developed out of a literature review on vertical wind turbines. 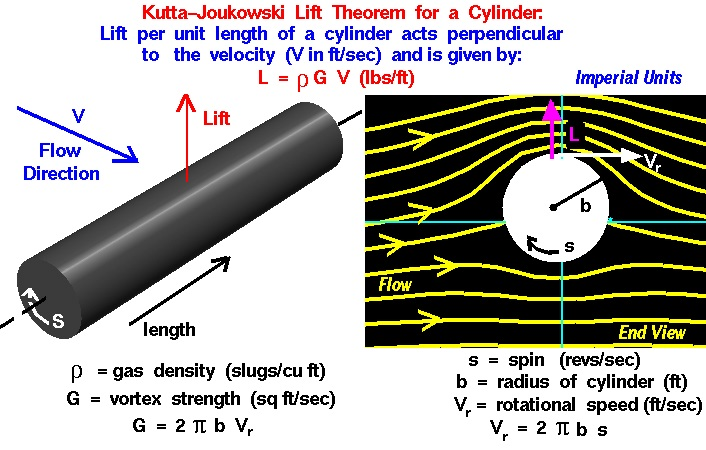 It was believed that due to the dynamics of a vertical wind turbine the linear momentum of the wind could effectively be transferred into angular momentum of the system. Applying this concept to a balloon mapping kit, the balloons would acquire angular momentum that would in turn stabilize the system by resisting changes to the angular momentum vector. Similarly vertical wind turbines have high lift to drag ratios, which would maximize the flying angle of the balloons. It was found however, that a vertical wind turbine would not be sufficient alone. Physically the system would still be unstable to procession due to the unavoidable torque applied by the string, required a lot of materials, and would be difficult to transport. 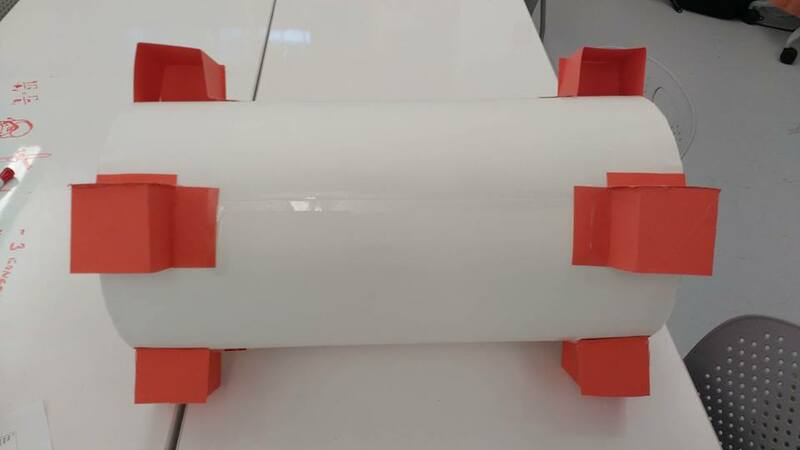 The final design of the MEB is clearly better because it does not suffer from any of the problems suffered by the vertical turbine and produces upward lift! Furthermore, some of the same concepts used for vertical wind turbine can be used to design fins for the MEB. At the same time we are also pursuing a much simpler design that can be produced quickly and has been done before in the past. 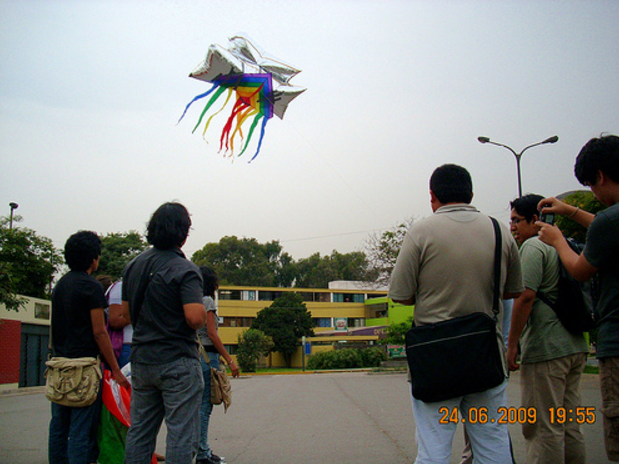 The design shown above combines a balloon with a small kite that can self-oriented itself into the wind. The best materials to be used for the kite are currently under-investigation. One balloon would be ideal for this design but it might not provide enough lift on a windless day. Therefore there might be a minimum wind speed requirement or two balloons will be used. Whoa, this is very cool! Have you done flight tests with these? I'd love to see some build instructions for either of these -- thanks for reporting in! That would be so great! We'd love to reach out to the Kickstarter backers to see if folks would like to try reproducing your design! Warren, we have just completed some full-scale testing. Currently we are refining and collecting data before we make any claims. We will definitely make a step-by-step activity guide, but we want to prove the concept to the best of our ability first. This should be completed by Dec. 12th, which is our Senior Design Showcase on Tufts Campus. You are welcome to come and see our design in person as well as several technologies developed by other groups that solve a wide range of problems. I will make sure you get an invite. Until then please check out the video I posted below on my Youtube account of our first full-scale test outside. We are currently working on building a model that can be flight tested. Hopefully we will be able to post a video by next week and we will make instructions for how build the model as we go. Would love to see this if it is posted yet! We came across a lot of design challenges and setbacks, but my team and I have just conducted some full scale tests and we are very happy with the results. At this point we do not want to say that the design is totally successful until we collect more quantitive data and have time to formally analyze our findings. I will post a video below of our very first test outside below. 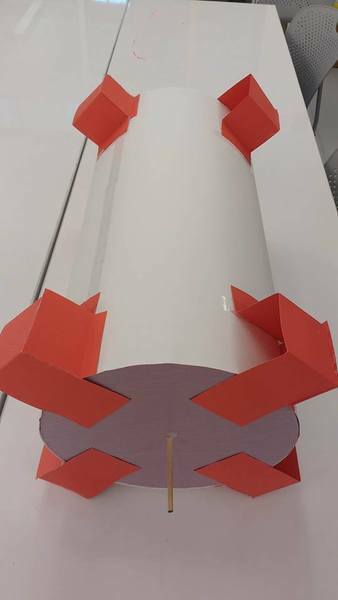 Since that test we made some improvements on how to mount the string to the balloons, which greatly increased performance. Also we did not have our camera attached to the setup out of fear of losing it on an untested system. I should be mentioned that it is able to easily lift the 40 gram Mobius action camera recommended by Public Lab. I apologize in advance for the filming! This was our very first test and data we are now collecting is of a much higher quality. Great! We'd love to see more photos and a video -- you can post it as an activity (you should be seeing a prompt to do this below your posts here) -- happy to help with YouTube embedding when you post! Thanks! Agreed! it's so cool to see spinning. We are working on another design in parallel to the magnus effect design described above. We are using principles of the Allsopp Helikites, but adding two balloons on top of each other to increase the lift from helium. We fabricated a kite out of ripstop nylon, and used rigid, lightweight hollow carbon fiber tubes for the keel spine and vertical spar. After hemming all of the edges, and sewing on pockets for the spar, we assembled the sail and keel and attached to the 36" mylar balloon with white vinyl tape. Test results with one balloon were so-so, and we determined that the addition of another helium balloon could add enough lift to stabilize support the camera. 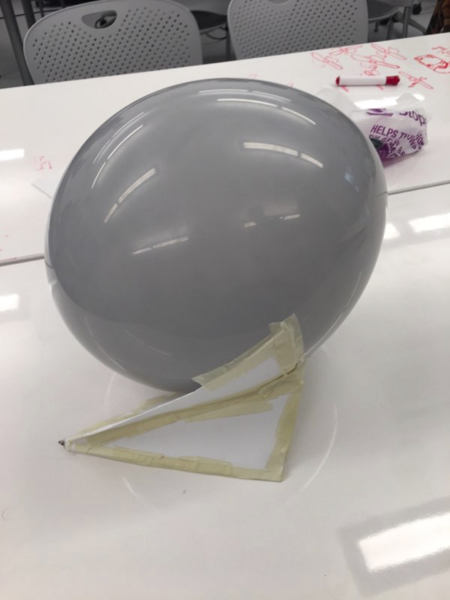 After experimenting with horizontal attachment of the two balloons, we decided that there was not enough surface area to attach the two balloons together effectively in that orientation. The additional drag of placing the second balloon on top of the first was a big concern, but it was the only method that could safely hold the two balloons together and to the kite. We then taped the two balloon faces to one another with the same vinyl tape and Saran Wrapped around the two for additional security. 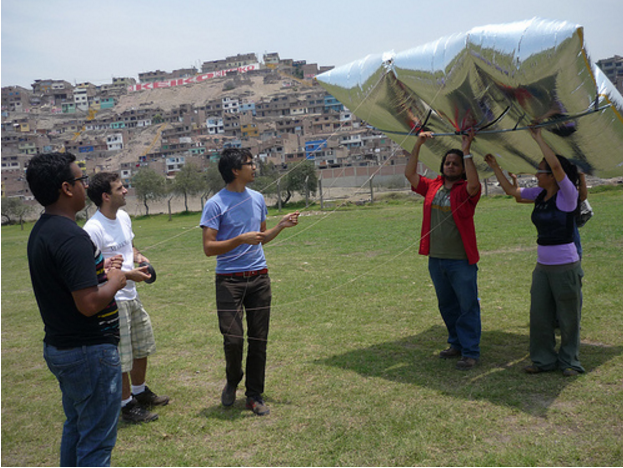 After taping the sail to the bottom ballon and attaching a plastic bag kite tail, we began full-scale testing. The next steps are to create a step-by-step DIY, and continue testing with an anemometer for wind speed, and taking measurements for height and angle of the assembly. In the future, a design with a pre-made, cheap kite should be tried, but it should be noted that all of the materials for the design were purchased for under $50. Gluing to mylar is currently not an option unless materials are purchased from the UK, and while the tape is not the most aesthetically pleasing, it has withstood many outdoor tests so far and seems the most effective and lightweight option. We are beginning that step-by-step guide today, and will be posting more test results soon. For now, here are two videos; the first is of our first attempt with one balloon, and the second shows the two-balloon assembly in the snowy weather last evening. oh yes if there's any way you could explain more about how i could build one too, so that i can help test your method, that would be awesome!